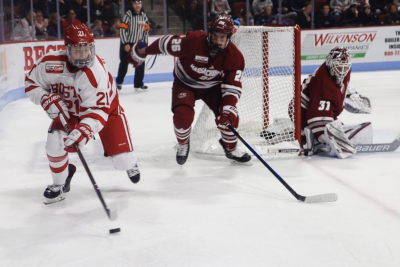 In a game that featured three surmounted deficits for the hosts, the Boston University men’s hockey team fell to No. 2 University of Massachusetts 7-5 at BU’s Agganis Arena Friday night. UMass (20-5, 12-3 Hockey East) wasted no time taking a lead in the opening frame as Minutemen forward Jacob Pritchard snuck in at the back post and knocked home a feed from forward John Leonard 46 seconds into the game. It was the sixth consecutive game in which the Terriers (10-11-3, 8-6-2 Hockey East) conceded the game’s first goal. The Terriers did fight back. Awoken by the early UMass tally, BU temporarily tied the game six minutes in as senior forward Ryan Cloonan sent a laser into the top right corner off a pass from graduate forward Max Willman. After being kept off the scoreboard throughout the first half of the season, it was Cloonan’s second goal in as many weeks. The Minutemen’s lead would be restored just two minutes later, as forward Bobby Trivigno tipped in a shot from defenseman Cale Makar. The assist was the 30th point of Makar’s season, and the lone point of the night for the Canadian who has taken Hockey East by storm. “[Makar] is about as good as anyone I’ve seen in this league in a long time,” O’Connell said. With four minutes left in the period, UMass forward Jack Suter launched a seeing-eye rocket from the blue line, soaring through a crowd in front and into the BU net. The assist went to defenseman Marc Del Gaizo, and the teams retreated to the locker rooms for the first intermission with UMass leading 3-1. “We kind of just took our foot off the gas at a few moments in the game,” junior forward Patrick Curry said in response to the Terriers giving up multiple goals in quick succession. Just past the halfway point of the middle stanza, BU tilted the ice on the Minutemen. During a 5-on-3 power play, a centering pass from sophomore forward Ty Amonte trickled through the UMass crease, and freshman forward Joel Farabee was there to sweep it in and give BU their second goal of the game. BU’s joy would be short-lived, however, as UMass regained the lead just a minute later. In a flurry in front, the puck fell kindly to forward Philip Lagunov, who buried it from a few feet out. Forward John Leonard was credited with the assist for his second of the night, and UMass had the one goal lead going into the second intermission. Three and a half minutes into the third period, Curry added his second goal of the game to bring the Terriers even 4-4. A rebound fell to the junior, who slid it in with assists credited to sophomore defenseman Kasper Kotkansalo and Amonte. Once again though, the level scoreline would not stand for long, as freshman defenseman Ty Farmer benefitted from a convenient rebound at 8:49 off a shot from Trivigno to put the Minutemen up for good. “We just weren’t sharp at times defensively,” O’Connell said. With the BU goalie pulled with 58 seconds remaining in search of a seventh, BU surrendered a breakaway to Leonard, leaving sophomore defenseman David Farrance no choice but to take the attacker down from behind. A goal would be awarded to Leonard in place of a penalty shot on an empty net, giving the sophomore a 3-point game and UMass a two-goal cushion. There would be no last-second miracle for BU, and the game finished 7-5 in favor of the Minutemen. Junior goalie Jake Oettinger had 27 saves in the defeat for BU, and his skaters would be the first to admit that the netminder was left alone at times against a potent UMass attack. “We didn’t help Jake Oettinger out very much,” Curry said. Senior co-captain Bobo Carpenter was absent Friday against UMass and may be unavailable for the first round of the Beanpot on Monday, as well. “I think it’s like 50-50 right now,” O’Connell said when asked if Carpenter will be available. Despite missing their leading goal scorer in Carpenter, the first-year head coach said he was impressed with his team’s offensive output. “Not having him and scoring five goals — if you gave me that before the game, I would have said I liked my chances,” he said. O’Connell said he was proud of his team’s effort against the second-ranked team in college hockey. “It was a tight game from start to finish,” O’Connell said. The Terriers will now turn their attention to the Beanpot, which kicks off on Monday night at 8 p.m. when they’ll take on Northeastern University in a rematch of last year’s championship game. Hi, great article. However, The photo’s caption is incorrect. It is Patrick Harper in the photo. (Junior) Not Patrick Curry.